Congratulations to our 2018 winner, Lisa Keys, who amazed us with her Korean Mushroom Lettuce Wraps. These little bites are simply bursting with potent flavors of Asia: the savory, sweet and spicy fermented gochujang and bulgogi marinade, all of which is tempered with the addition of strips of juicy, tender-crisp bosc pear flesh. 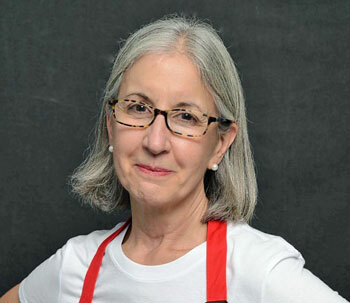 winner of our 11th annual recipe contest! In spite of their exotic nature, we found the wraps are quick and easy to prepare with pantry ingredients. In fact, we recently presented them as a scrumptious snack before watching the women's figure skaters short program in Pyeongchang. What a tasty way to usher in the viewing of amazing Olympic athletes such as the Russian skaters Alina Zagitova and Evgenia Medvedeva. I am married to my husband Bill and mother of two children (Caitlin and William) and grandma to Annabelle. I love to cook and bake. Creating recipes is a hobby I share on my blog at GoodGriefCook.com. I am also a Food Network CHOPPED Champion, winning the amateur home cook Mother’s Day episode in 2014. I live in Kennett Square, PA which just happens to have an authentic Korean market nearby. I am often inspired by the ingredients I find there, and that is how I came to create this recipe using our favorite fresh local mushrooms. Mushrooms are a flavorful blank canvas that can be enjoyed in most any ethnic cuisine. Many thanks, Lisa, for your submission and for introducing us to your splendid website. Here's wishing you much joy cooking with mushrooms in the years to come! 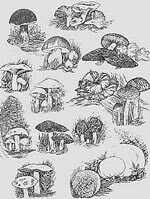 As always, we send our sincere appreciation to all the individuals who answered our call for mushroom themed recipes. It's a pleasure to see the imagination and originality that are the hallmark of those who love to spend time in food preparation. Every year we ask ourselves: How will the respondents top last year's contributions? And, every year we are humbled by you, our dear readers. As far as we're concerned, your responses have earned you Olympic Gold Medals in our kitchen. Imagine That - Now There's Truffle Gin! 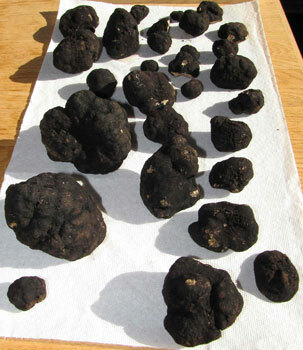 Some people like to dine on truffles. Others, it now appears, like to drink theirs! Introducing Truffle Gin, in two versions, White Truffle and Black Truffle ... the choice is yours. These truffles didn't make it into the gin bottle. One of our more remarkable memories of 2017 was the Vantage River Cruise that we took in the early fall. Gliding down the Seine River, accompanied by swans and fallen leaves, towards the D-Day Beaches of Utah, Omaha, Gold, Juno and Sword was in many ways a sobering experience as we pondered what had happened there. Yet, the sheer beauty of that now-serene landscape also balanced - if that's possible - the high price paid by so many. Ensconced in the comfort of the river boat, our attention often turned to the on-board activities, including several cooking demonstrations hosted by the culinary staff. One of the most delicious of these is this month's recipe for Matelote, a traditional French stew of fish and wine, that was offered by Executive Chef Igor Oluic. There must have been about a dozen of us in attendance as the chef demonstrated the recipe in the Captain's Club. At first, we all were so serious, then gradually amused and entertained by the chef who constantly updated the recipe: "That's not how I fix it," he'd declare and suggest alternative ingredients rather than those proposed in the written recipe. Frankly, this really is a divine and light preparation, and we're posting the original version as well as the annotated version (shown in italics) so that you can decide for yourself what would most please your palate. 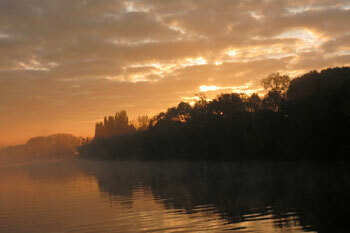 Sunrise on a foggy morning on the Seine River.